The cast of NOISES OFF. Photo by Kyle Cassidy. Michael Frayn’s enormously popular 80s play, a zany farce about doors and sardines, relationships, and mistakes, is playing at Curio through May 30. The setup: Act one shows a third-rate touring company’s final rehearsal of a terrible play called Nothing On. Act two deconstructs the production with a backstage view of entrances and exits, cast jealousies, mistakes, and the ridiculous mischief going on behind the scenes. Act three reverts to stage front view, and everything goes all kerflooey as personal conflicts intervene and the actors desperately try to hold on to a semblance of order. But their comically pathetic attempts to cover up huge gaffes fail, and everything turns into hopelessly chaotic mayhem. The audience, which has seen the frustrated director repeatedly explain to the actors how the play is supposed to go down, can appreciate how completely and comically it is being demolished. 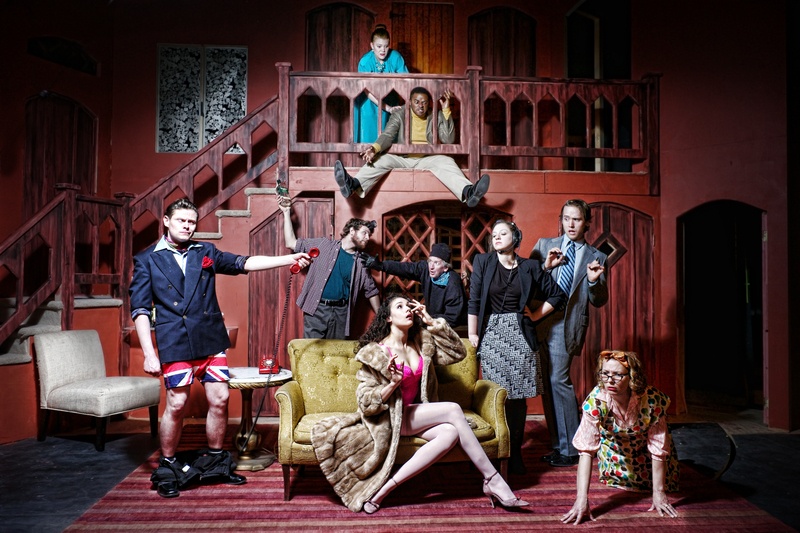 NOISES OFF presents a sizeable production challenge. I wondered how Curio, a small theater company operating out of a church space in West Philadelphia, would handle the large revolving set the play calls for. The effort and expertise put into the stage/backstage set has paid off and Curio has pulled off a feat of organization and design. Intrepid Curio nails the set. Under the guest direction of Mauckingbird’s Peter Reynolds, the plot mechanics run like a charm, and the cast invests plenty of energy in this madcap show. 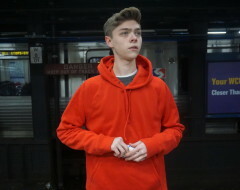 However, for a complete success the director could have taken a look specifically at the comic pause and created more differentiation between deliberately overacted “bad actor” roles and the “real” wacky characters. In some, but not all, cases there is no discernible difference between the touring play actors and the characters who inhabit the backstage story that wraps around the play. 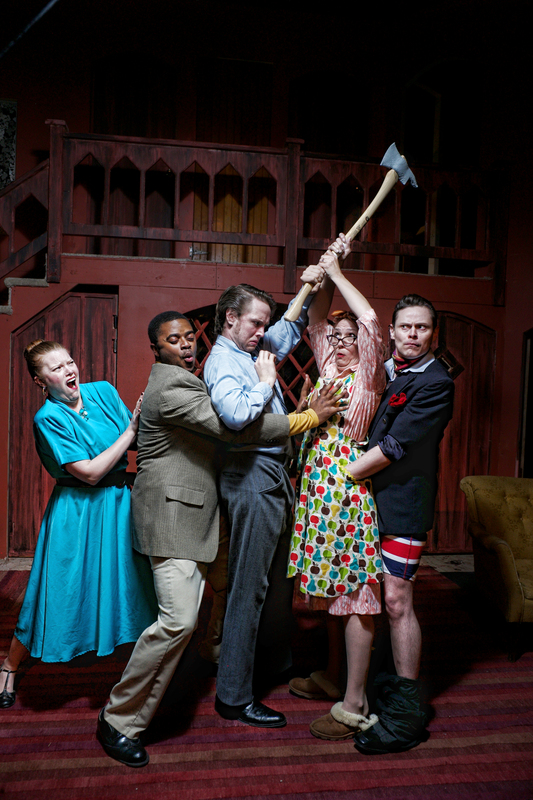 Kyra Baker, Newton Buchanan, Andrew J. Carroll, Aetna Gallagher, and Doug Greene in NOISES OFF. Photo by Kyle Cassidy. I was interested in seeing this farce because Michael Frayn wrote it. He’s the same guy who premiered the intellectual gem Copenhagen in 1998. While the rarified air of Copenhagen allowed audiences to feel smarter than they actually are, NOISES OFF allows audiences to feel relieved. Frayn believes that people are worried that if their embarrassing tangled feelings should spill out, it would be a personal disaster. They laugh at farce in the theater because they see their fears exaggerated and safely happening to actors instead of to them. I wondered if there could be any structural resemblance between these two vastly different works, and there is: Both plays employ repetition and variation. In Copenhagen the ghosts of Werner Heisenberg, Neils Bohr, and Bohr’s wife Margrethe replay Heisenberg’s visit to the Bohrs in 1941. The characters explore and try on different versions of what happened at that visit and why. In NOISES OFF the characters try to perform the same moments again and again, but they accidentally come out ludicrously different each time. Frayn’s NOISES OFF is deceptive. It’s not easy to do. For farce lovers there’s much to be enjoyed even when not all the pistons are firing. Curio’s opening night audience certainly had a lot of fun with it, shrieking and howling at everything– from the riotously funny to the mildly amusing. [Curio Theatre Company, Calvary Center for Culture and Community, 4740 Baltimore Avenue.] 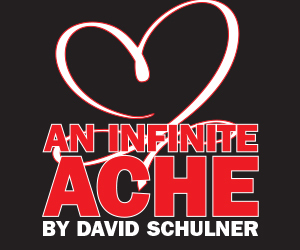 April 30- May 30, 2015; curiotheatre.org.